The 57th annual Bergen International Festival began on 20 May, 2009 in Bergen, Norway. The largest arts festival in the Nordic countries, it was inaugurated by Norway’s very own King Harald V and Queen Sonja. At Grieg Hall, King Harald gave a speech which officially opened the festival that was dedicated to music, literature, theater, dance, opera and art. Sudha Ragunathan had the honor of singing in the presence of the King and Queen of Norway during the inaugural. 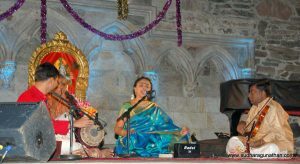 The following day, 21 May, again saw a full length concert by Sudha, which in a way was a prelude to the Ganesh Festival that was to commence the following day, 22 May, 2009. The Bergen International Festival and Bergen Hindu Sabha joined forces in events in Håkonshallen, outdoors in the city and at the Hindu temple at Minde. Sudha was accompanied by Shri. BV Raghavendra Rao, on the violin, Shri. Neyveli Skanda Subramanian on the mridangam and Shri. Ramakrishnan Raman on the moharsing. Presenting carnatic music to a western audience in places like Norway, which is not within the mainstream of Indian music but where the audience is well within the contours of appreciating good music, is always a pleasantly challenging situation to any artist. For Sudha, it is always a delight to be amidst such a completely compelling audience. 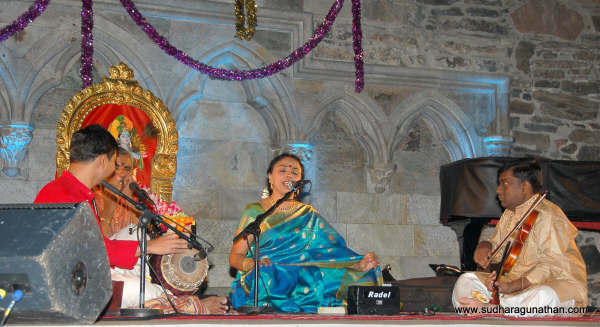 Giving them a blend of chaste carnatic compositions and highlighting its greatness through its manodharma, continuously feeling the pulse of the audience, modulating the music without diluting the art – there was a sense of completeness and fulfillment at the end of the concert….that the music reached through the mind and into the hearts.